Hello, is been a while. This is a project from long ago, I think about 2 years old, I'm not sure, I have a wip image dated from sep2011. While I don't remember that much since I worked on it whenever I felt like it and recently whenever I had the time, I know I spent a lot of time and effort doing this. The most time consuming were the flowers and I still feel like they need more shades. I planned to make the bg like in the original scan but it didn't worked out for me as I wished, I scrapped the woodwork behind once and strated again, but I still didn't liked it so I went with a sky even thou it doesn't give the piece the same depth, I had a lot of troubles with the clouds, can't make decent ones to save my life. The tree branch is all painted, the patterns are made by Gimei. There are 361 layers, my laptop almost cried when I had ps, sai, and music opened. Happy new year, have a good one. Thanks to my friends who supported me while making this. oh my tina gave us some miku love ! nice love at that, love the brush effect and the details you provided. such a beautiful piece. the flowers, petals and kimono all wonderful with the blending with miku in the garden. I really like he background you chose instead of copying it from the original scan. I love the colorful scene! other than that the whole walls looks very soft and clean. I love the color of the sky, it's calming and tender. I remember seeing this while it was still a WIP and hearing you grumble about the roses, lol. But it was totally worth it - it all looks so lovely and peaceful and just so darn pretty. And this comes from a person who's definitely not a Miku fan, lol. I especially like the sky, your own background ideas and most of all - that pretty lighting on her and the scenery around her. 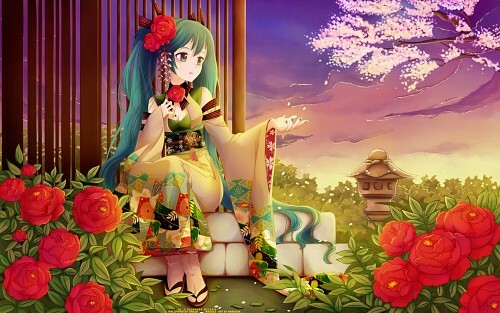 Lovely~~ *o* love the vectoring/painting. Nice progress ;D I would be interested to see how your previous idea would have turned out..
Made my initial reaction comment on AP, but can't help commenting here too. It's so pretty and colorful! I'm glad you stuck with it and completed it! I just wish there was an HD size so I don't have to crop her head and feet! I remember you showing the scan a while ago XD But you did a really great job in extending the scan and changing the colour scheme especially love the sunset sky. Me? Disappointed? Heck no! It's absolutely fantastic! Just a bit of nitpick, would be nice to see a bit more darker shading on the sakura petals. Sunset is usually a time of more stark contrast. I've always loved this scan, so it makes me happy to see a wall with it that's so well done! I love all of the colors on this, and making the red so much bolder than in the scan was definitely a good choice. :) Nice job! I <3 for finishing this, I was waiting for it a long long time. It's awesome really, your hard work really paid off. I especially love the colors and the peaceful feeling this wall has. It's perfect really, I only wish her bangs would be a bit longer and a few extra eyelashes wouldn't hurt either.